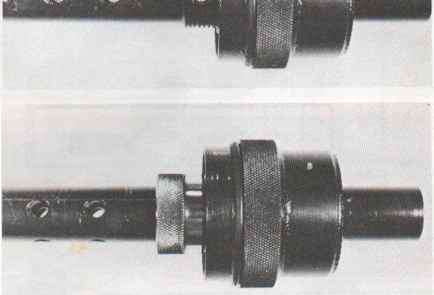 Three Dater suppressors: R22 (top) and R22-SL (center) for externally threaded barrels; R22-SL for internal threading. Three variations of the R22-SL suppressor. Quality is his watchword, as Dater uses only top quality ordnance steel and aircraft-grade aluminum alloys for the manufacture of his units. All of the steel parts, including the interior ones, are blued with a deep black oxide. "However, the steel baffles for the .223 and .30 caliber units are usually stainless steel because of wear and corrosion resistance. The external aluminum parts are black anodized for both aesthetic and protective reasons, while I leave the internal aluminum in its natural state for thermodynamic reasons," he says. Dater is unique in that he offers a very straightforward warranty for a year. To his knowledge, no other major manufacturer does that without charge. It's worth it, though. Phil Dater's units are not inexpensive. Rather, like their manufacturer, they are very classy. As you may already know, Phil Dater is a physician, specifically a radiologist. In the summer of 1980, he turned away from the corporate world of a large, multi-specialty group in Albuquerque to work in the country. "So far I have resisted all efforts and recruiting to get me back to the 'big medical world' full time. I got tired of the twenty-four-hour, on-call basis and the hectic pace. Now, I call my own shots, so to speak, and I have much more time for designing and building suppressors. That's paying off very well, I might add." Dater says. Success is not without pain, though, creating some very real problems for Dater which are reflective of all small businesses. When he's busy, he gets into the bind of not being able to offer fast service, yet hiring employees would tie him into more and more governmental paperwork. The Dater "James Bond Special," a model R22SL internally threaded into a .22 Walther PPK-S.
present business. If I add employees, I'll be spending more than 30 percent of my time handling paper on wage taxes. Social Security, unemployment, nondiscrimination records, etc. I'll be damned if I'm going to work as a free clerk for the U.S. government," he declares. "I tend to get off on tangents when I get talking about supposedly free enterprise and big government. But now, I stick to what I know best and enjoy most-my company and my sound suppressors." As he moved from custom work to a larger production and marketing status, Dater tried to simplify and standardize his line. He says, "I settled in on my most popular models and designs then standardized for production. This not only reduced costs, it also allowed for some shelf inventory." Under the roof of his Automatic Weapons Company, Dater produces both integral and muzzle attachment suppressors for a wide variety of weapons. His integral models are more efficient, require some weapon modifications, and are sometimes more costly, while the ones which attach to the end of the muzzle are not as efficient, do not require weapon modification, and cost less. Dater describes his integral units as "barrel suppressors built around the barrel porting system and using a muzzle suppression component. In my 9mm unit, for example, I use baffles in the front section and wrap screening around the ported barrel in the rear. I did use fiberglas, but have now gone to stamped baffles, instead. It just works better." Dater likes this baffle and screen concept, saying, "not only does it tend to cool the gases, but it also diffuses them so that a shock wave doesn't hit the outer tube. Basically, I use a special aluminum screening because of high specific heat of the aluminum rapidly absorbing heat from the gases. "Also, when I use the stamped baffles, I find that the more I use, within reason, the more effective the unit becomes. For example, in my earlier .223 and .30 caliber suppressors, I used eleven baffles. Now, I use twenty." One of Dater's most popular designs is his RST, using the Standard Ruger .22 caliber pistol with a rather common, but highly effective integral suppressor arrangement. It uses the barrel porting principle with two suppression chambers. He offers the same arrangement with the Ruger Mkl pistol for the more serious shooter. *Tve also altered the sights. My unit adds about three inches to the weapon and quiets it by a measured 27 dB during lab testing. Empirical observation shows a comparison with a C02 pellet pistol in terms of muzzle signature. "One of the benefits of this design is that the customer can do his own service—cleaning and repacking. The customer can buy all the materials he needs for about two dollars at his local hardware, then repacking takes about an hour. I tell people to repack after 500 to 800 rounds," Dater notes. The overall suppressor length is six inches with a one-inch outer tube diameter. The weight of the suppressor component is five ounces. He also offers his R10 for the Ruger 10/22 and an Rll for other .22 caliber semiautomatic and bolt action rifles. Both units are integral models, using ported barrels. His AR7 is, of course, meant for the Armalite AR7 Explorer rifle. These three units are essentially physically identical. Because of the barrel alteration, an accessory optical or telescopic sight must be employed. Dater's lab tests indicate a sound reduction level of 29 dB, providing about the same report as that of a Daisy BB gun. Fitted to a bolt-action weapon, the Rll reduces sound by a measurable 31 dB. Unlike some of his other suppressors, these require repacking after 2.000 to 4,000 rounds, which the customer can easily and cheaply do himself. The R10, 11 and 7 series suppressors are 14 inches in length, 1.25 inches in diameter, and each weighs sixteen ounces. A Dater M22 suppressor mounted on an M16 with a Javelin night vision device. 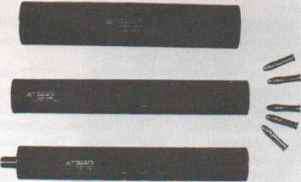 Cross sectional of the Dater M22 and M30 suppressors. The model SG9 mounted on a Sten MKII SMG. combined all his various 9mm integral suppressor models into one basic unit which he calls the SG9. His concept is aimed toward the individual who has a $200 NFA tax stamp on his one suppressor, but who also owns several 9mm submachine guns. Dater explains, "Since the outer tube is the part that's serially numbered and registered as the suppressor, I make the one basic SG9 model for all 9mm weapons. Then I insert the correct barrel and barrel mount into the rear of the can to adapt to the customer's particular weapon. "That way, if a customer purchases one basic SG9, he can use it for his S & W 76, say, then using only two adapter parts, he can use it on a Sten, or using another set of two parts, it will fit the MAC 9mm. All we change are the two adapter parts that mount the suppressor to the weapon." weapons, e.g.. Ml6, HK93, Mini 14. etc. The SG9 is 12 inches long and 1.6 inches in diameter. It weighs 2.3 pounds. At press time, Dater had not yet had the SG9 measured scientifically on a laboratory machine, but from other measurements, it achieves sound reduction of about 21 dB, which is a very conservative measure. One knowledgeable military man who has tried Dater's SG9 on both a MAC 10 and on an S & W M76, says, "Getting down 18 dB on the blast from a full auto weapon is damn good. Actually, his models we tested did a bit better-more like 23 dB." Somewhat surprised, Dater admits, "I understate what my cans will do so the customer gets a little more than he bargained for. I'd rather do that than make claims my products can't live up to." Phil Dater's SG9 suppressor with adapter for the Sten. This same basic suppressor may be used with a variety of 9mm weapons. the ammunition near the subsonic level, yet still properly operate the weapon's action. "I refer to this as my port-blocking collar," Dater says. "Some 9mm ammunition, especially reloads and some of the commercially marketed subsonic ammunition, may not have enough oomph to operate the weapon's recoil system properly. This is why I include a barrel sleeve, or port-blocking collar as I call it. to seal off the rear set of barrel ports. "This increases velocity by delaying gas bleed-off in the rear of the suppressor. Of all ammunition, 9mm Parabellum is unbelievably variable in its loadings. Sometimes this can be a real headache, especially for a suppressed automatic weapon. But this collar overcomes that nicely on the SG9." 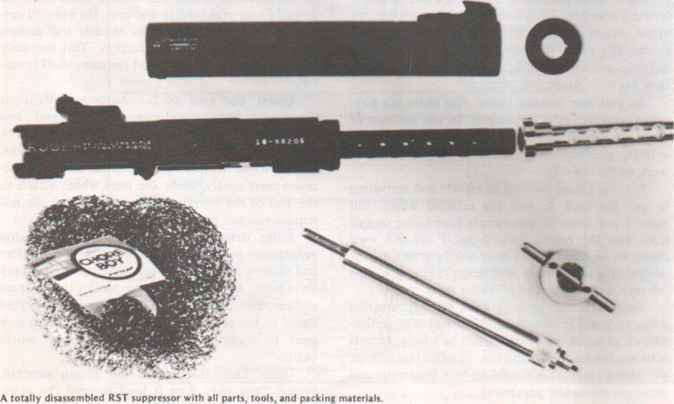 Dater's muzzle-attaching suppressors create another set of engineering problems, although not quite so complicated as those of the integral models. He notes, "Basically, you have to deal with muzzle and suppressor alignment, plus the addition of new optical or scope sights on some weapons because of the can's diameter. Also, you no longer have the advantage of a ported barrel, so subsonic ammunition must be used if you wish to avoid ballistic crack. That can create problems for the recoil systems of some weapons. But, with other weapons and systems, a screw-on suppressor works wonderfully." Dater's muzzle suppressors include his R22 in both regular and slimline models. These screw-on suppressors are designed for a variety of .22 rifles and pistols. Both models are 6.5 inches long, while the standard has a diameter of 1.25 inches, as opposed to the slimline's 1-inch diameter. The advantage of the slimline is that the weapon's normal sights can be used in most instances. The slimline also uses internal baffles rather than the usual replaceable packing materials. Cleaning the slimline is done by immersion in a suitable solvent. The degree of suppression of these units is 25 dB, as measured using proper equipment. An absolute measurement is difficult because, as Dater points out, "The absolute sound level will vary significantly with the type of weapon and barrel length. However, the degree of sound reduction is quite suitable for undetected backyard shooting in residential areas at, say, garden pests." Phil Dater's port blocking collar for his SG9 suppressor shown dismounted, then mounted on a S & W 76. How to make gun silencer and suppressors? How to do internal baffles for gun silencers? Why is the MK 19 40MM suppressor built loose? How to make a silencer for a sten?